LISTENING TO MY FRIEND I was stunned in silence. While his eyes leaked, and his soul gasped for breath I was still. He gushed out the emptiness which filled him to the brim. It was overflowing and spilling out. 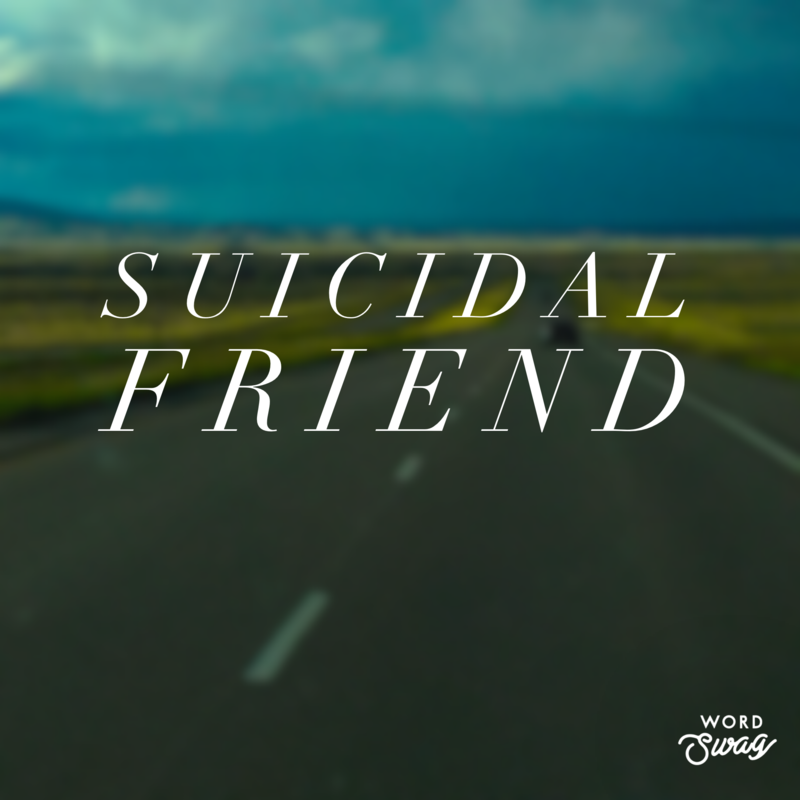 Words crashed one on top of another as he blurted out his depressive state. Immense suffering had overtaken him. Apathy was his new home and black darkness the color of his rainbow. He went on to tell me that ending his life was constantly on his mind. A day earlier his family left the house and he was alone. He was overwhelmed with grief as he thought about his life. His failures capsized the boat of hope. His thoughts turned toward self-harm, that of the most heinous kind—suicide. In the pale blue haze of clear non-existent white veils the hideousness of gross meanderings. Calling out of the shadows deep within, shattering all the frozen years of emotion. Waging a war by the reappearance of apathy and waste. From the belt loops of yesteryears balanced needlessly on a foundation of shaky steel, stir deep groans of wounded heel. Not for all, yet all for not. Climbing and dancing and sheading all that traps and ensnares. Dreaming awhile of lavish lights and suns and moons and rings of Jupiter stare in a cosmic speck of dust on my soul. Oh, my soul! This gut-wrenching soul filled with all that I am and all I will ever be. Ever be because of nothing less than a challis full of bitterness and pain. Pain like that of a cold titanium tip of a chiseled edge piercing that which is hidden, and then gone. Gone again, fleeting and drifting back into the long halls of sadness. Impregnated upon the broken pieces of shattered visage. Contained in this moment is the elation of euphoria, pure bliss like that of an exhilarating ride. A ride that lasts but for a moment, yet a ride that cannot and should not ever be forgotten. That moment where once again there is a knock on the door. A tug on the rope wrapped around my neck. That moment that just left but is back again fighting and wasting away like a bag of rotten potatoes in the missing eyes of a dead corpse. And I wonder, will it ever be back? Ya know, that day when all was good? He went on to tell of how hope everlasting is found in Jesus Christ. My friend and I haven’t spoken since that day. I am confident in Christ he and I will never speak again, after all, it was only a moment. The National Suicide Prevention Lifeline— 1-800-273-8255 (TALK)— Open 24-hours and its confidential. © 2019 Supremacy Of God.